Compare the best laser eye surgery treatments, clinics and special offers. Click the button below, enter your postcode and get quotes and special offers from up to 3 laser eye surgery clinics near to you. Millions of people across the world have enjoyed the benefits of laser eye treatment. In the UK alone, over 120,000 people opt to undergo this procedure every year which is a testament to its effectiveness in helping patients achieve 20/20 vision and freeing them from the inconvenience of wearing glasses or contact lenses. Laser eye surgery is a quick and painless procedure that can correct refractive errors in a wide range of prescriptions. Most patients with myopia (nearsightedness), hyperopia (longsightedness) and astigmatism can be treated effectively with laser eye surgery. In the 25 years that laser eye surgery has been available, it has progressed from an experimental procedure to one that is considered to be very safe. There are hundreds of laser eye surgery clinics across the UK, most of which offer options to help patients afford the treatment. If you have a visual impairment that you believe can be fixed by laser eye surgery it is worth checking out our comprehensive laser eye surgery guide to how to find the best laser eye surgery clinic for your condition and budget. We also track and evaluate the typical laser eye surgery costs charged throughout the UK by various national and independent clinics. LASIK (‘laser-assisted in situ keratomileusis’) is the most frequently performed laser eye surgery to correct myopia (short-sightedness), hyperopia (long-sightedness), astigmatism and presbyopia (the need for reading glasses). PRK/LASEK will be used for the small number of patients not eligible for LASIK. LASIK eye surgery changes the curvature of the cornea so that the light entering the eye will be correctly focused on the retina at the back of the eye, resulting in a clear image. The surgery is normally painless and should take about 10 minutes for both eyes. 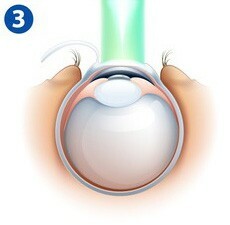 Most patients should have normal vision a few hours after the surgery. The surgeon will put anaesthetic drops into the patient’s eye. Once the eye is numb, the surgeon will clamp the eyelids back to keep the eye open. This is a painless process. The cornea is exposed by creating a flap in the epithelium (the thin outermost layer of the cornea), or creating a slightly deeper flap in the cornea, using a high-precision instrument. For nearsighted patients the cornea will be made a bit flatter.  For a longsighted one, the cornea will be made rounder and for an astigmatic patient, less elongated and more spherical. When the surgeon has finished reshaping the cornea the flap will be replaced. Antiseptic eyedrops will be added and normally an eye patch for a few hours. Vision should be normal in 24 hours. In essence, this artificial replacement lens will enable you to focus on near, intermediate and far away objects without requiring contact lenses or glasses. During the procedure, which takes around 20 minutes, the natural clear lens of the eye is permanently replaced with an artificial intraocular lens (IOL). 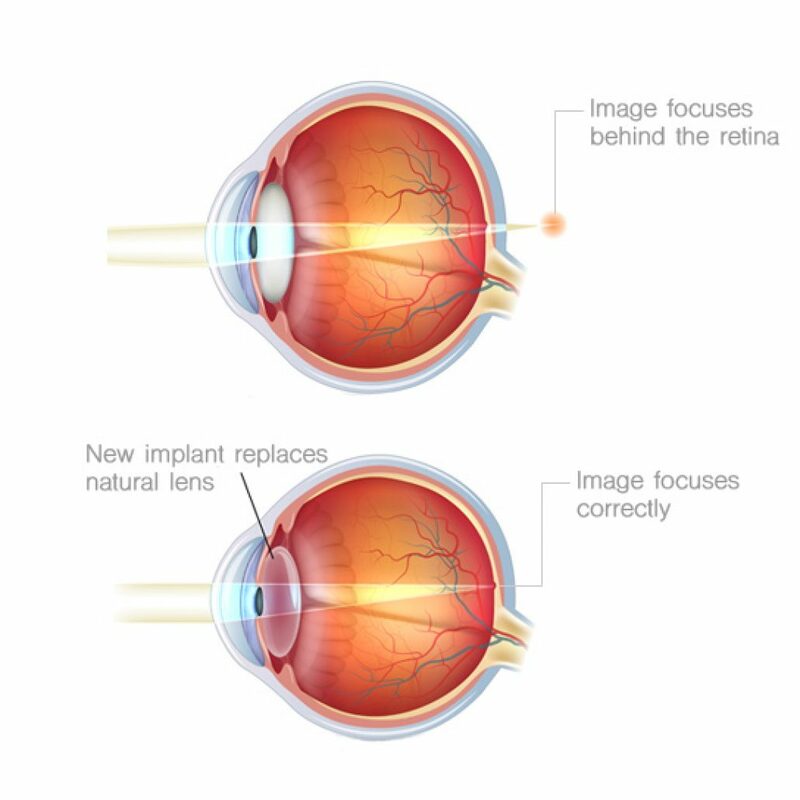 The procedure itself is the very similar that done to remove cataracts, the difference being that the lens removed for cataract patients is cloudy and not clear. You can find our guide to typical lens replacement surgery prices here. A cataract is the clouding of the normally clear lens inside the the front part of eye which distorts the the passage of light – similar to looking through a misty camera lens. Cataracts can not be corrected by glasses or contact lenses and are most common in people aged 70+. Thankfully, there have been major advancements in cataract treatments over recent years and now surgery can quickly restore normally vision. Today, cataract surgery is the commonly performed operation in the UK and the world with 300,000 procedures carried out each year in the UK alone. 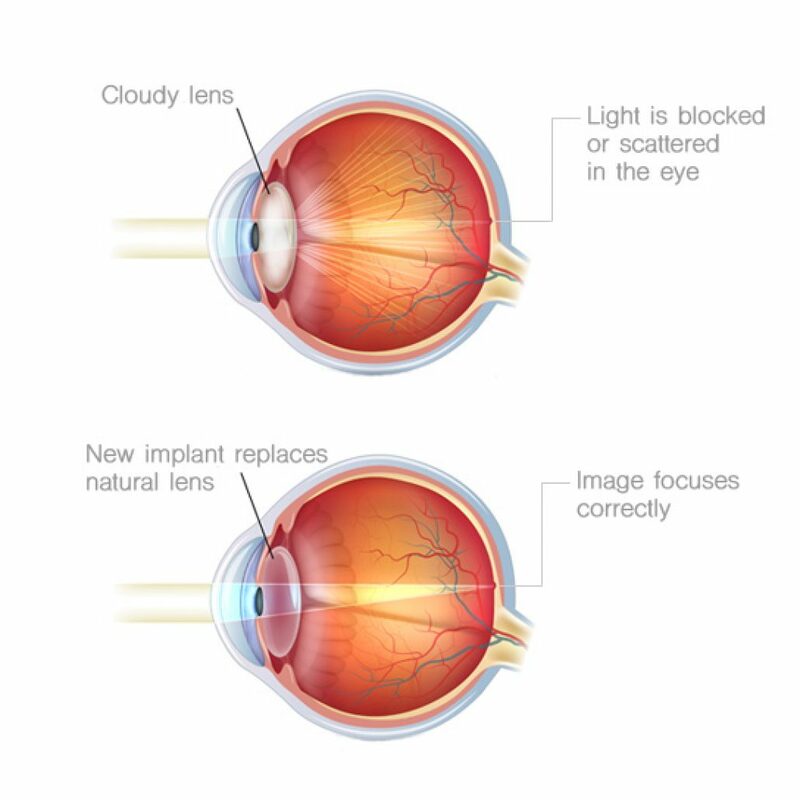 The surgery itself only lasts for 10-15 minutes and involves removing the cloudy or opaque cataract, replacing it with a clear implant known as a intraocular lens (IOL). With private surgery you can chose one of three lenses standard mono-focal IOLs, Mono-focal IOLs with monovision or Premium multi-focal IOLs depending on whether you are happy to wear glasses after surgery or not. If you are interested in learning more, check out our guide to cataract surgery and costs.  Compare prices and financing options for laser eye surgery, lens replacement surgery and cataract surgery for clinics across the UK and save hundreds of pounds on your treatment.